Eckhart begins to speak directly about ACIM at around 11mins into this audio. This audio by Eckhart Tolle goes in-depth into the purpose of A Course in Miracles (ACIM or “the Course”) with a beautiful clarity. He says that he was inspired to talk about it as he’s often asked what he thinks about the Course. “I love it!” he says, and he shares that in fact, he used it as a medium to teach with small groups. 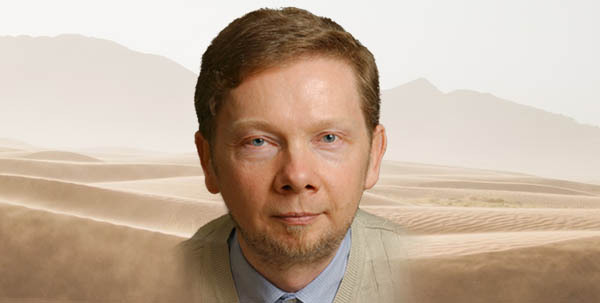 Eckhart says that only a small percentage of channelled writings go deeply and he feels ACIM is one of those; he also shares that some non dual students may be put off by its old-fashioned Christian terminology, but if you can look beyond it and see what it points to—which has nothing to do with gender or Christianity—you will discover that it has many passages of great spiritual power and beauty. He calls it “extraordinary.” He says that the Course purposefully uses dualistic language to meet the deceived mind where it believes itself to be (in a dualistic experience) in order to lead to an actual experience of non duality. Eckhart says that if you find that Presence is already transforming your life, the way you experience your relationships, and increasing inner peace and freedom from externals on a consistent basis, then you probably don’t need the Course. However, he says that if you seem to “get it” in the moment, whether in Satsang, or experiencing moments of stillness when you’re not challenged by anything, but then you seem to lose it, or become disturbed easily as if you’ve never heard any spiritual teachings; then, he suggests that applying the Workbook Lessons of the Course could be very helpful. The purpose of A Course in Miracles, Eckhart says, is to wipe the blackboard of your mind clean; it’s akin to taking a sponge and voluntarily relinquishing all meaning and judgments. He calls it an act of humility because the mind thinks, I know this or that. Once the blackboard is clean, you become completely present and innocent like a child, and there’s an enormous energy there; the Course calls it the holy instant. Eckhart explains that the Course—like all authentic spiritual teaching—aims to take you to the edge of your mind of trying to understand anything mentally, of letting go, of going into the beautiful state of not knowing, not needing to impose judgments on the world—and then you jump off and it is the end of compulsive thinking. He describes that you can still use thinking if you need it, but it doesn’t use you anymore, you are no longer the thinker. The ego is gone. Once that has occurred, you become a living demonstration of peace, a “teacher of God” as the Course calls it, and it is only when you know who you are, when you’ve gone beyond all concepts of the world, that you can teach peace. Enjoy this video clip where Eckhart shares the deep meaning of the very first Workbook Lesson from ACIM, “Nothing I see means anything” (this clip is an excerpt from the original full-length video of the above audio recording).